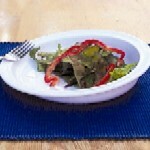 This clear polycarbonate plate guard keeps food on your plate. This is a wonderful item to have for those who are one-handed, lack dexterity in their hands or for the poor low vision. Using bumpers or plate guards eliminates the need for specialized inner lip plates. You can create your own! 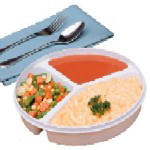 The plate bumper allows you to retain your dignity and eat independently. An internal groove on the plate bumper attaches to the rim of your plates forming a bumper part way around the plate. 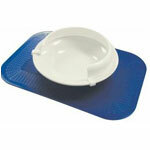 Plate guards are available in three sizes: small, large and extra large. The small bumper guard fits six (6) to eight (8) inch diameter plates, the large bumper guard fits eight (8) to nine (9) inch diameter plates and the extra large bumper guard fits 10 inch diameter plates. 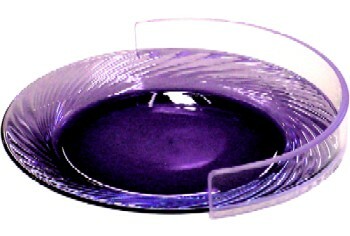 Use these bumber guards when dining in at home or when dining out at restaurants or social gatherings. Another fine product for seniors from ElderStore!